INTELLECTA DESIGN makes research and development of fonts with historical and artistical relevant forms. This font is a FREE software for personal and non-commercial use only. But donations for my HISTORICAL STUDIES about the history of the letters, calligraphy and typography are accepted. This font is for unlimited distribution, since attached in a file zip together with this text. For commercial use (of this limited version only) you need register this software by sending U$ 15,00 to the following paypal account - estiliza@gmail.com - After that, you need sent me a e-mail (paulo.w.designer@gmail.com), so I will send to you a legal permission to use the font. In 1733, London master letterer George Bickham collected penmanship samples from 26 of his contemporaries and published The Universal Penman. Thanks to Bickham’s monumental compilation, eighteenth-century English Roundhand became one of the most popular styles of formal writing; in recent years it inspired several digital typefaces. Penabico is Intellecta Design’s free interpretation of the genre. It comes with loads of stylistic alternates, ligatures, ornaments and fleurons, as well as abbreviations and intricate, ready-made calligraphic words. While the enhanced OpenType version contains all these goodies and more, some of the ornaments, catch words and other glyphs are accommodated in supplementary fonts for easier access in non-OpenType-savvy programs. 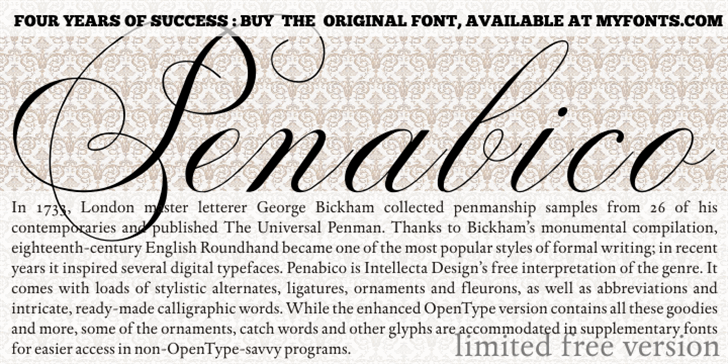 Penabico LIMITED FREE VERSION is a trademark of Iza W, IntellectaDesign.